I'm well known for putting my foot in it at regular intervals. So why not scour the neighborhood for second-hand or thrown-out rubber boots , drill drainage holes in their soles (if their soles are not already holed), and plant them up? 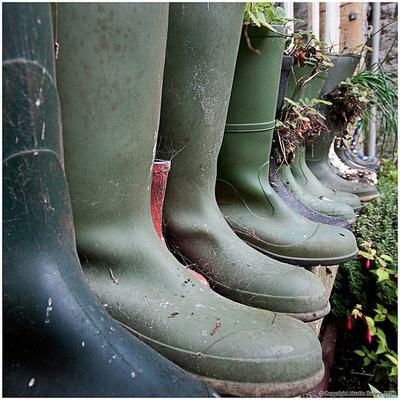 As the gardener has done, lining up lots of pairs, or even mismatched single boots, can make a striking display. You could even grow vegetables and salad in them. Judging by the scent of my son's old Wellies, cheese plants or stink weeds would also do very well! Please use the Comments form at the bottom of the page to leave your feedback about this footy planter idea, or click the arrows to see more unusual container gardening planters, including toilets, garbage cans, paint cans, and a tree stump! Read our article on crazy container garden ideas, and find out all the crazy things people grow their flowers in!